I am sure it is not a Freestate uniform, but more than likely an officers uniform , though the bands I have never seen. All you need to do is request the statement, give his name and witness statement number 662, also be sure to give your email address and it will be sent to you in a pdf file , it may take a month to receive the WS, I am sure it will answer your question about the uniform and so much more. I have done much research on my grand father and have received many witness statements from Dublin, they do a fabulous job but have a lot of requests to work on , Patience is the key. A million thanks for your response Finbarr. I do have a copy of my grandfather’s statement which is what sent me on this voyage of discovery! Alas he said no more than the fact he was Adjutant and Intelligence Officer of the Longford Brigade. I am however interested to hear from you that it is possible to receive PDFs of other Witness Statements as where I believed they were only available to next-of-kin. There are several from members of the Longford Brigade that I would love to see so will set about acquiring them to help in my research. I am also currently awaiting the arrival of his application for an IRA pension which should offer more insight. 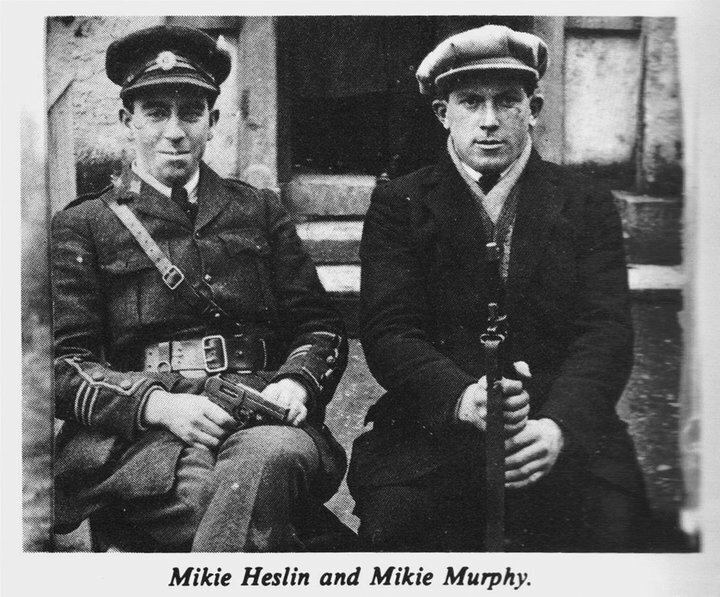 Your welcome Mike, was Mikie Heslin also a member of the Irish republican police force or IRP? I glanced through a book called “Hearts and Mines” and it mentioned that the Longford IRP wore what are called Brassards a white stripe of sorts on the arm, google Brassards. The witness statements are available to every body, I have about fifty of them but all are Co Cork men because of the research I am doing at the moment, like you when I recieved my grandfather’s he also mentioned names which I requested from Dublin and so on, and it just went from that. It is great to read another persons input of an action your own kin was at. No doubt Mikie’s pension record will hold much more info through others that were testifying for his actions, my Grand father was 30 pages long and had so much we did not know about, and yes these are available to next of kin only. Here is a link to a very informative website it shows where the Auxies were billited in Longford and much more. Recently the administrators kindly published my own grandfather Michael O’Driscoll’s witness statement in the http://irishvolunteers.org/ page, I was a little aprehensive doing it but I hope it will create a sort of discussion and information gathering type thing, I encourage you to do the same and others who may read this, in time it could be a very successfull forum for information such as the RIC link above. One thing I do believe is that the over 1700 statements which were written for the Bureau of Military History by the people knew they were part of History in the making. This is why we all should make them available for others to read, I am certain this was their intent. The index of names used to be available online but does not seem to be any more, if you need me to look up some names for your requests of Longford men on my list, let me know. Thanks once again for the very informative response. I’m pretty sure grandad never joined the police as he was still in his job at the County Council when my mother met him in the 1950s. The mystery of the uniform remains! I have written to the BMH and look forward to seeing what his colleagues had to say about the period and if he gets any more name checks. I noticed too that the index of those who made statements seems to have disappeared from the BMH website. Fortunately, I compiled a list of contributors from Longford some time ago, so I will gradually work my way through them. To Michael Heslin – through the serendipity of the internet I came across this website and noticed your request. Can’t help with the uniform though. I have seen your grandfather’s name, Michael Francis Heslin, mentioned as Adjutant of the Longford Brigade in the excellent book “They Put the Flag -a-flyin'” a story of the Roscommon Volunteers but it also covers some information on surrounding counties, Longford being one. See Page 461, the author mentions also a further book called “County Longford and the Irish Revolution 1910- 1923”, you may find that at http://www.isbs.com. The Roscommon book may still be available from http://www.generationpublishing.com which is (?was) the publisher’s website when I purchased it in September 2006. It’s an excellent book and like you I was doing some family research and found my father’s name listed and discovered more information about his war involvement, he was arrested in July 1922 as an anti Treaty man and spent 18 months in gaol for his trouble. He relocated to Australia in 1924 – for which we, his family, are all eternally grateful. Thank you Phil. I have got both books and they are a both a great read. The “County Longford” one also gives a lot of mentions to my grandad’s brother-in-law James J Brady who was also very involved at the time. It was a family thing…grandma and her sisters were also involved in Cumann na mBan! There’s also an Aussie connection: Grandad’s elder brother Thomas (who may have used the name Peter) escaped to Australia rather than be tried for poaching! I’m still researching the details of this. Thanks once again for your contribution Phil. Finbarr, I have received three statements from the Military Archive and I would like to thank you for letting me know that these were available as pdf files. They have made fascinating reading and have confirmed some of the things my grandad said in his own statement. Gen Sean MacEoin’s statement was particularly long but offered great insights into Longford events such as The Battle of Ballinalee and the Clonfin Ambush. I see that the index of contributors is no longer available online and am wondering if you have a digital copy available? If the moderator allows it, I am happy for him to include my email address here. If not, perhaps we could work out another way that it could be sent to me (assuming you still have it). Once again, many thanks for your help and have a wonderful summer. Like Phil, I stumbled across this site when I was researching my grandfather’s involvement in the civil war. My grandfather is James J. Brady. Also similar, and as I understand it, my grandfather left Ireland to escape persecution. But that’s about all I know. I’ll check out the Longford book to see what I can find.